How to Clean Stuffed Animals: Washing Machine or Hand Wash? Is Teddy getting stinky? Or maybe you accidently drop him in mud in camping trip last weekend? Considering how they are cuddly magnets for germs, with the added bonus of being your child’s side whole day long, regularly cleaning stuffed animals are pretty necessary. How to clean stuffed animals? It seems daunting if you have never cleaned one before, but it’s rather easy to do, with either your trusty washing machine or by hand. First, know that the less they are washed, the longer they will remain to look all new. So try to make sure the only thing you ever need to clean off your stuffed animals is dust. 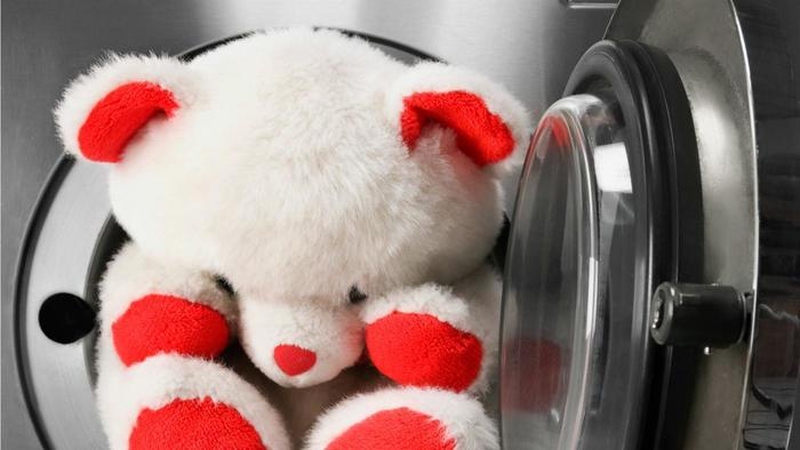 Before you start cleaning your stuffed animals, make sure your stuffed animals can be washed in the washing machine. Now that you have made sure all the above are checked for, now examine it for any parts that you could remove and if there are any strings you need to secure. Then the washing machine should not have an agitator, since it will cause the stuffed to ball up, with the agitator displacing all the stuffing. Ensure that your stuffed animals are ready to be washed one more time. Done? Then place them in a mesh laundry bag. This is to give an extra layer of protection from all the pummeling and snagging in the machine. The machine should be set on the gentle/delicate cycle. While it could tolerate the more aggressive power of the usual cycle, you probably shouldn’t take that risk. Hot water should be avoided, especially the ones with glued on items, since the heat will weaken the glue tackiness. Hang dry when you are done. Clamp it on the hanger or use an S-hooks. Potential damage could be dealt with the dryer heat, even when turned on low, weakening the glue and plastic parts. Manufacturers might label some stuffed toys as machine washable, but usually, those only apply for the furry, cloth part of it. The structural integrity of the whole stuffed animal itself can be pretty fragile with the rough tumbles of the humble washer. The only nondestructive option for decontaminating them is hand washing them. Grab a plastic garbage bag and pour in half a cup of baking soda.For bigger stuffed toy, consider a full cup or more as appropriate. Place the stuffed animals to the bottom of the bag. Squeeze out most of the air, leaving just enough tumble room for the toy when you shake it. Twist and tie the plastic bag, or use a rubber band. Pick the bag up and grab the top with your dominant hand. Your other hand will be at the bottom. Tumble the content of the bag, gently in a circular motion, up-down then left-right, for approximately two minutes. Be careful that the hard objects attached to your toy might puncture the bag. Keep the concoction to rest for about 15 minutes. Let the baking soda do its work to deodorize the toy, clean the grime and dirt from the material. WARNING: Avoid inhaling the baking soda. Open the bag and shake off your baking soda covered stuffed toys. Discard the bag or reuse it, just top up on the baking soda. Grab a vacuum cleaner hose or a soft-bristled brush to get rid of the remaining caked-on soda and such. Slap the toy like how you would do to a pillow to remove the last of the baking soda. You could consider using an EPA-registered disinfectant for the same, germ and odor eliminating results. Follow the instructions on the back. Do your research on their website EPA.gov. For white colored toys, diluted chlorine bleach is recommended by experts as a disinfectant. Be careful since some material might get corroded by it. Server responsed at: 04/21/2019 10:55 p.m.